This class has been approved for 10 points towards the ALOA PRP Recertification requirements. If you have NOT yet achieved a PRP Certification, this class can also serve as valuable preparation for the Mandatory Categories section of the exam. Download an Enrollment Application by clicking here. Our 10 day Professional Locksmithing course teaches the skills necessary for anyone working with locks. 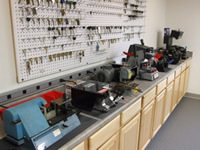 It was created to give those who are just starting a career in locksmithing, or who require locksmithing as part of their job in the military or other government service, a solid background in the basics. It is also ideal for anyone considering a locksmithing career but who wishes to first learn more about the trade. What is MACS and what can happen when you ignore it when creating a key? Does masterkeying increase or decrease security? What is the EPD of a common cylinder? What is the most likely problem with a cylinder that works OK until it is inverted? When a blank key is inserted in a cylinder, which set of pins prevents the plug from turning? MBA USA tool bag - $42 value! Work Mat - $10 value! Plug follower - $27 value! Pin tweezers - $15 value! Warded pick set - $14 value! Standard pick set - $41 value! Pin kit - $115 value! Impressioning file - $33 value! File cleaner - $15 value! 15-in-1 screwdriver - $15 value! 2-in-1 screwdriver - $3 value!